There are more hard drives than ever before in the workplace. Hard drives are in desktop computers, laptops, servers, phones, USB thumb drives, printers, copiers, and other equipment. In 2015, technology companies shipped more than 2.6 billion devices containing hard drives, according to IT research firm Gartner. The only way to stop fraudsters from stealing information from old computer hard drives was by destroying them completely. The warning came after a study showed thousands (22,000) of ‘deleted’ or ‘reformatted’ files were recovered from old computers purchased online. Even if confidential data has been erased, research has shown it can be recovered – and this can lead to a security breach. Perform regular clean-outs of storage facilities. A 2015 Industry Study showed that 37% of U.S. businesses have never disposed of hard drives, USBs and other hardware that contain confidential information. The only way to ensure sensitive data is physically destroyed is to destroy the hard drive. Industry experts predict a continued boom in cyber crime. In terms of cost, the average consolidated total cost of a data breach rose 23% to $3.8 million in 2014 compared to the previous year. Asset Disposition offers a complete solution through a single source. We specialize in environmentally responsible recycling and reuse of retired IT equipment. Our strict chain-of-custody ensures the security required to manage risk. We can manage all IT asset disposition (ITAD) requirements including logistics, de-installation and removal, packing, receiving, processing, data erasure and destruction, aftermarket services and responsible recycling. Data Erasure and Destruction Onsite and offsite degaussing, erasure and physical shredding services coupled with an industry-leading chain-of-custody process mitigate the risks of a data security breach. De-Installation and Asset Removal Onsite service technicians perform hardware de-installations and onsite serialized audits in the office and the data center. Our experienced technicians de-install over 50,000 servers annually. Responsible Recycling As a certified e-Stewards Electronics recycler, we adhere to stringent recycling requirements of electronic waste and ensure we are compliant with local, state and federal regulations. 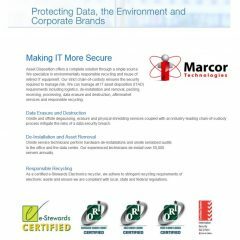 Marcor Technologies would like to help you keep your confidential information safe by offering drive destruction services. Please contact us for a quote! © 2019 Marcor Technologies, Inc. All rights reserved.